Freebies like Wi-Fi and parking attract guests keeping an eye on the bottom line to the Rodeway Inn Evans north of Denver. All 93 exterior-entry accommodations at the two-story Rodeway Inn offer free Wi-Fi 42-inch flat-panel TVs and work desks. Some rooms are non-smoking. Guests chill out by the seasonal outdoor pool and freshen their wardrobes with the guest-use laundry facilities. Parking is free. Pets are allowed for a small charge. 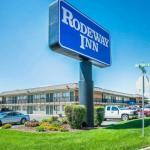 At the intersection of highways 34 and 85 the Rodeway Inn sits between Denver and Cheyenne in northern Colorado. Guests find some shopping and dining within two miles of the motel or head 30 minutes to Loveland for more options. Rocky Mountain National Park is just over an hour west. Kids enjoy visits to the Denver Zoo and games at Sports Authority Field at Mile High both an hour's drive. Denver International Airport is 54 miles away.